Dr Warren Bowden will provide a presentation on “Sustainable Manufacturing” at the upcoming ILM Automotive Leather Supply Chain conference in Munich on May 21. Dr Bowden is Scottish Leather Group's Sustainability and Innovation Director as well as Managing Director of one of its operating companies, SLG Technology. Leather manufacturing has been known as a notoriously wasteful process. Several leading companies at the forefront of the tanning industry have made significant improvement, but the whole industry needs radical change in order to secure positive public perception of the clean and sustainable production of our product. The presentation outlines SLG's route from its Zero Waste Strategy (2004 onwards), encompassing the wide remit of a sustainable manufacturing process through circularising its manufacturing ethos and de-carbonising its products - as presented in a quantified LCA (life cycle assessment) measurement - for the production of high quality, "sustainable, low carbon leathers". Luxury automotive leather that does not cost the earth. The paper will focus on the circularity, the opportunities to further reduce product LCA, reduce carbon intensity using renewables and reach the stage where SLG’s conversion of the by-product from the meat industry creates a positive impact, rather than a negative one. Dr Bowden will also outline some of the findings of a recent DNA marking project linked to traceability, where it is SLG’s intention to be able to trace every hide to every car, using a variety of techniques; that is, not just to be able to trace, but to provide comfort to its customers that their hides are responsibly sourced. Dr Bowden will be joined at the conference by speakers from JBS Couros, One 4 Leather, FILK, Frost & Sullivan and Wollsdorf Leather. Further speakers and topics will be unveiled in the coming weeks. 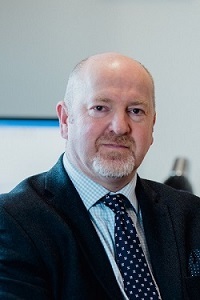 Dr Warren Bowden is a Chartered Environmentalist and the Scottish Leather Group's Sustainability and Innovation Director as well as Managing Director of one of its operating companies, SLG Technology. A Fellow of the Society of Leather Technologists & Chemists, and Inventor of the pioneering and patented Thermal Energy Plant, Bowden has spent the past 15 years of his 25 year career in the sector leading the “drive to zero”. Date: Tuesday, May 21, 2019. Time: Half-day (afternoon). Registration/coffee: 12-12.50pm, conference 12.50pm - 5.15pm (includes a 30 minute coffee break/networking session). *Prices advertised exclude a 3.5% booking fee. UK and EU delegates may be subject to VAT. Delegates who register to attend the conference are also entitled to a 10% discount off the recently published in-depth report “Automotive Leather – a modern and sustainable industry”. For more information please click here or to purchase contact Maria Wallace: maria@edifydigitalmedia.com. All presentations will be in English only. The conference is organised by International Leather Maker (ILM) and is sponsored by TFL, Zschimmer & Schwarz and JBS Couros. theSauerReport is an event supporter. Click here to see the confirmed speaker programme.